The floor of the Hol­land House is divided into varying section that cater to dif­fer­ent offices. 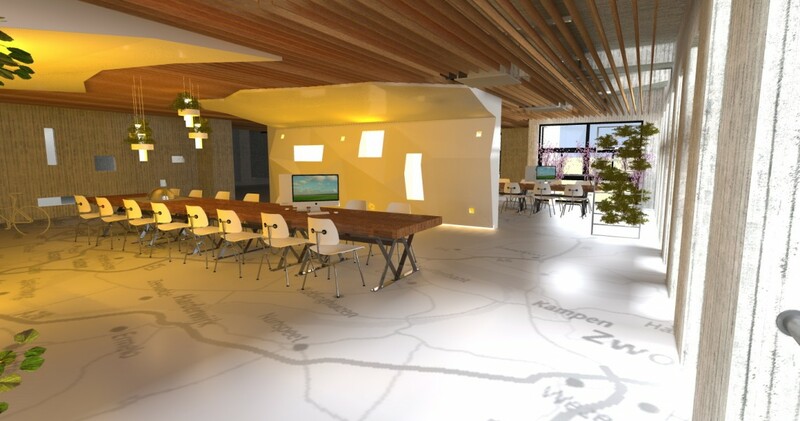 These spaces allow for inter­action between offices to encourage intercompany col­lab­o­ra­tion. 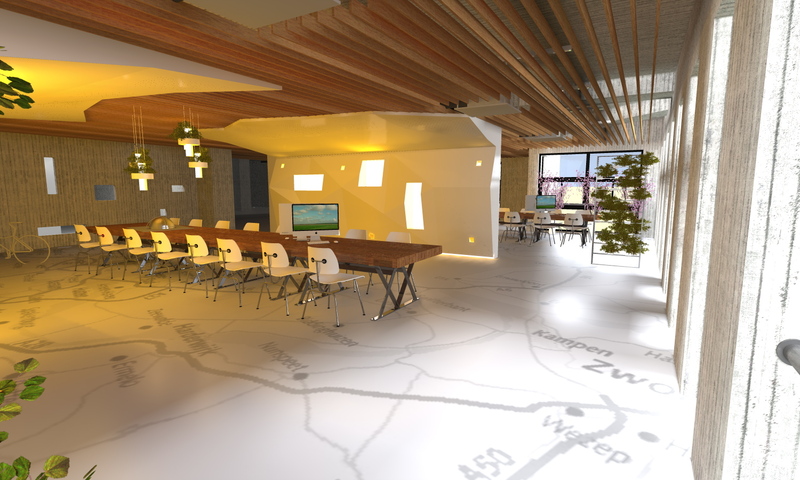 This model allows for open work-­spaces, in com­bi­na­tion with more secluded spaces for meet­ings or appointments. AULa imagines a series of varying vol­umes sep­a­rat­ing the space. These vol­umes function as curved, flowing bod­ies that cre­ate spaces with different qualities. The functional requirements of operating an office are integrated into these vol­umes. 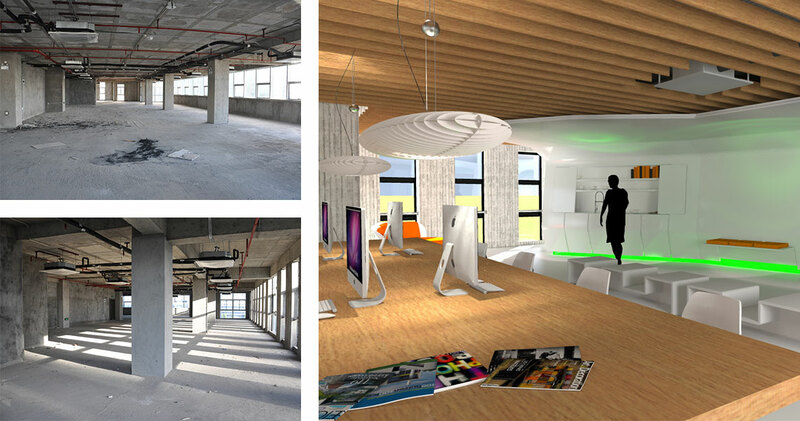 They offer, kitchen appli­ances, cab­i­nets, expo­si­tion space and lighting. AULa sees the vol­umes as a means of dividing the space, by acting as a body placed in the open space of the office. These bod­ies are inspired by the ele­gant form of a seag­ull. The torso of the bird can be seen as the cab­i­net, in which the dif­fer­ent func­tions find their place. 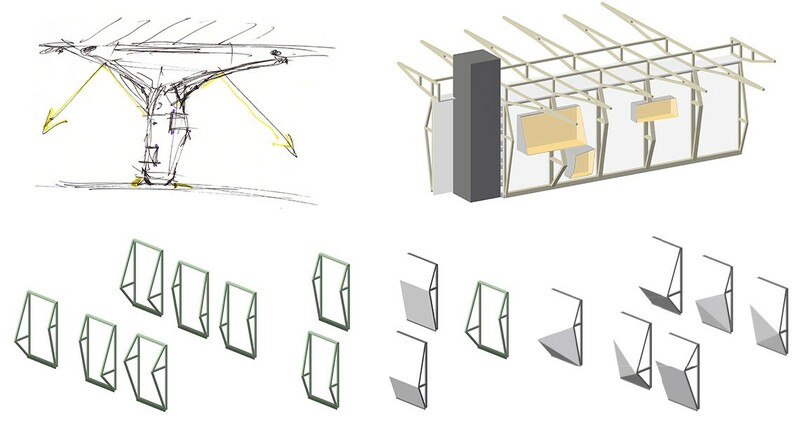 The wings spread out, covering the work­spaces and separating the dif­fer­ent functions in the room. While the legs work to lift­ the vol­ume off the ground, cre­at­ing a plinth. The wings grad­u­ally change from a solid to a per­fo­rated mate­r­ial, while becom­ing thin­ner. In this way, the wings gen­tly make the tran­si­tion towards the ceil­ing. The room dividers, seen in sec­tion, illustrate how the dif­fer­ent func­tions can be inte­grated in the shape of the body. 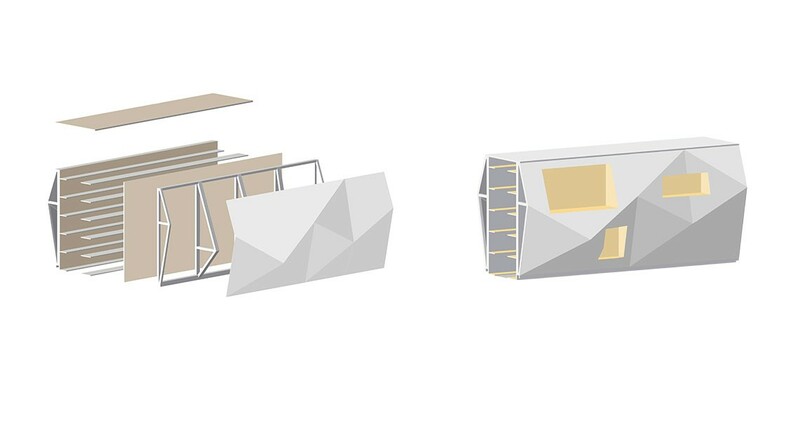 Cab­i­nets used for exhibit­ing objects can be cut out of the shape, cre­at­ing a niche. These niches can be illuminated with dif­fer­ent colours, corresponding with its con­tent. Screens could be exposed on demand. Nor­mally cov­ered by the cab­i­net, it does not dis­turb the sim­plic­ity of the body. Only when needed, dur­ing a pre­sen­ta­tion of exam­ple, you can open the cab­i­net and use the screens.